Women are lagging significantly behind men when it comes to financial knowledge and security, increasing their chances of falling into poverty. A year ago, in the emotional aftermath of her divorce, Ann Burr Clevenger found herself in a world of bewildering, new things. There was the living alone for the first time in over a decade; the new job in a new city; and there, on her kitchen table, in her inbox and her desk, a growing collection of documents detailing her retirement savings ― a daunting, taunting, seemingly incomprehensible mess. Her ex-husband, an investment banker, had taken care of the family’s finances for the duration of their marriage, Clevenger explained. Clevenger had “never been solely financially responsible for buying a house, running a household and properly supporting two children. And I had to figure it all out in three months,” she said. Since graduating college, Clevenger had been financially independent, working job after job without pause. But though there was money in the bank, having a plan for it all had never been a priority. As a child and later as a young adult, she was never educated on financial planning. Then she met her ex-husband, who began managing her finances early on in their relationship. “We merged our accounts before we even got engaged,” she recalled. Research shows that 80 to 90 percent of women will be solely responsible for their finances at some point in their lives due to the death of a spouse, divorce or other reason; yet women across the board report lower levels of financial knowledge and confidence than men. This is not a new problem, but as evidence mounts of the financial instability that many women are facing, especially in retirement, a sense of urgency has recently grown around finding solutions for this troubling gender gap. In March, a report by the National Institute on Retirement Security found that women are 80 percent more likely than men to be impoverished at age 65 and older, while women between the ages of 75 to 79 are three times more likely than men to be living in poverty. A 2015 Standard & Poor study on global financial literacy found that just 30 percent of women are financially literate compared to 35 percent of men. 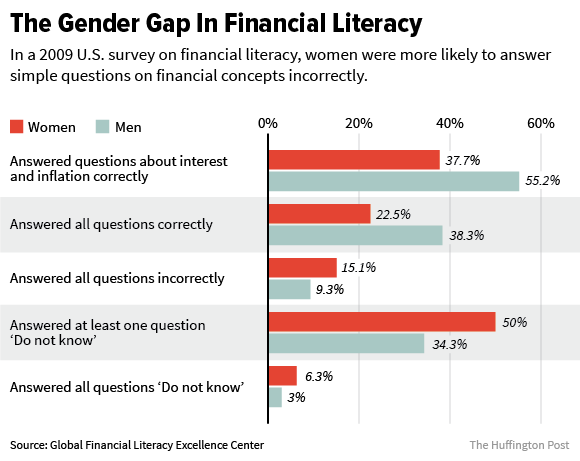 In 2014, a study conducted by the Global Financial Literacy Excellence Center found an even greater gap: only 22 percent of U.S. women surveyed, compared to 38 percent of men, could answer three simple finance-related questions correctly. Other nations in the survey showed a similar pattern. “Women in countries as different as Germany, Australia, Canada, Italy, France, Sweden, Switzerland, New Zealand, Japan and the Netherlands all display lower levels of financial literacy than men,” economist Annamarie Lusardi, one of the study’s authors, said last year. An overwhelming majority of American women ― more than 85 percent ― don’t know how to invest or choose a financial product, according to a 2010-2011 Prudential report. Fewer than 2 in 10 women surveyed said they felt “very prepared” to make wise financial decisions. This lack of financial knowledge and confidence has impacted women’s ability to plan ahead. Only one-third of women in America have a financial plan in place, according to the Prudential survey. Almost half of women who earn more than $30,000 a year fear that they’ll up “broke and homeless,” per a 2013 report by Allianz. With money woes weighing heavily on her mind, Clevenger shared her concerns with a coworker one day last year, a few months after the finalization of her divorce. Hearing her worries, the colleague recommended she check out a “financial fitness thing” organized for free by her new employer, Aetna. “It’s definitely something you say ‘I should totally do that and you never do,’ but in this case I did actually end up going down and making an appointment,” said Clevenger, who’s worked as a social media manager at the health care company since August 2015. Financial wellness programs have been offered by some companies since at least the ‘80s, but the prevalence and variety of them appear to be on the rise. Fifty-eight percent of U.S. employers have seen “an increased significance of financial wellness in their organization,” according to a 2016 report by consultancy firm Aon Hewitt. By the end of this year, Aon Hewitt estimated that more than 7 in 10 U.S. employers will offer their workers some kind of financial wellness program. At Aetna, financial wellness programs were first introduced in 2007. Their launch had been prompted, according to company spokesman Matt Clyburn, by a troubling new trend among employees. Today, the company offers a variety of financial wellness options, including workshops, one-on-one consultations with financial planners and online tools, like calculators and checklists. In 2015, nearly 5,500 Aetna employees completed financial wellness assessments and approximately 7,700 participated in one-on-one consultations or workshops with financial planning professionals, Clyburn said. In total, the company’s financial wellness offerings reached more than 25 percent of the workforce; 77 percent of Aetna’s participants were women. Clevenger remembered meeting a financial planner from Financial Finesse, a California-based financial wellness firm, in a quiet room at Aetna’s Hartford, Connecticut, office last year. “I feel empowered,” she added. Based on a growing body of research into the efficacy of financial wellness programs at the workplace, Clevenger’s positive experience is not atypical. “According to the evidence I have reviewed and my own work on workplace financial education, these programs have an impact,” Lusardi, a professor at the George Washington School of Business who’s written extensively about financial wellness, told HuffPost in an email. Pointing to her research, Lusardi said women are more likely than men to admit that they “don’t know” the answers to money-related questions ― a very good sign when it comes to financial wellness. Women are also more likely than men to take advantage of financial education provided by their employers, according to a report last year by Financial Finesse. In 2014, for instance, women made up two-thirds of total employees who completed a financial wellness assessment through Financial Finesse’s online learning center. With this in mind, experts say companies can play an important role in bridging the gender gap in financial wellness by offering educational programs to their employees. Programs targeted specifically at women could be even more beneficial. “Employers are uniquely positioned to help,” said Financial Finesse CEO Liz Davidson in a release last year. Instituting financial wellness programs can also be enormously beneficial for employers themselves, experts say. Financial wellness programs can also help retain and attract talent. Megan Yost, head of participant engagement at State Street Global Advisors, told the story of a successful three-day financial wellness bootcamp organized last year by one of its corporate clients. “Following the event, the employer saw a direct impact on employees’ 401(k) decisions. For example, over half of employees increased their deferral rates from the previous quarter. The employer also gained many intangible benefits. People said the event made them happier to work for that organization,” she said. For employers looking to adopt financial wellness programs at their organizations, financial advisors have a few key pieces of advice. Companies, Kasin added, should also ensure their employees are well aware of the programs available to them. About 30 percent of employees working at large firms had no idea such programs were on offer at their workplace, according to Bank of America’s 2016 Workplace Benefits Report. Financial insecurity is a problem that impacts the majority of Americans. Since the so-called Great Recession of the late 2000s, more than 70 percent of people in the U.S. ― regardless of race, gender or socio-economic status ― have been living paycheck to paycheck, according to a 2013 Bankrate.com survey. The American Psychological Association said financial stress is the most common cause of stress in the U.S. But for women, the numbers are particularly dire. ― Women live, on average, five to six years longer than men. This means their retirement savings need to cover longer life spans. ― However, research shows that though both men and women’s retirement savings fall short, women face a far more challenging future. A median 45-year-old man is projected to have a savings shortfall of $267,233 to meet average retirement expenses at age 65, according to Financial Finesse. In contrast, a median 45-year-old faces a shortfall of $522,262. ― There are many reasons for this staggering retirement gender gap. Not only do women earn significantly less than men, but they also tend to receive lower average monthly Social Security payments due to less time spent in the workforce (reasons for this include leaving work to care for children or elderly parents). ― Women may also receive reduced monthly benefits due to the death of a spouse. According to a 2011 U.S. Census bureau report, the median age of widowhood across all ethnicities was around 60 years, but the average life expectancy of U.S. women is 81 years. A woman may receive reduced Social Security benefits if widowed. Social Security benefits are typically reduced by one-third when one spouse dies, according to a 2005 report in the Social Security Bulletin. ― In 2014, the average Social Security income received by women 65 years and older was only $13,824, compared to an average benefit for men of $17,911, according to a National Institute on Retirement Security report. ― Widowed women depend on Social Security benefits for 58 percent of their income. Widows are twice as likely to live in poverty at and after retirement age than widowers, the same report concluded. ― There’s also the issue of divorce. It’s estimated that between 30 and 50 percent of marriages in the U.S. end in divorce, which can have devastating financial consequences to both parties. Research shows, however, that divorce tends to be more financially damaging to women than men. Dr. Nicole Terry (left), a financial education instructor with the LiSa Initiative, led a six-week financial education course at a women’s prison in Jacksonville, Florida, earlier this year. To limit this gaping financial divide between the genders, experts say a multi-pronged approach is necessary. For one, wage equality needs to be addressed. But enhancing financial literacy is also critical. Groups like the Global Financial Literacy Learning Center and the LiSa Initiative, a grassroots movement aimed at providing financial education to women, believe that financial learning needs to be enhanced at every stage of life, from schools to workplaces. “These differences tend to form early in life and schools are the most effective way to reach a large number of women,” said Lusardi, an advocate for the inclusion of financial literacy classes in not just high schools and college, but elementary schools as well. “Until we add financial literacy in school or in the workplace, it is hard to expect major changes, financial literacy is not acquired by simply watching the world around us,” she added. The LiSa Initiative is also working to bring financial wellness workshops to women in communities across America, including prisons as well as religious, military and veteran organizations. Earlier this year, Dr. Nicole Terry, a financial education instructor with the group, led a six-week financial education course at a women’s prison in Jacksonville, Florida. Terry taught 21 inmates “everything from the psychology of money to practical lessons, such as creating a financial budget and reducing debt,” a LiSA Initiative spokesperson told HuffPost. It was an emotional experience for everyone involved. “Nicole cared about us and made us feel like we were an important part of this world,” one participant said. Clevenger said she now encourages all her colleagues to attend financial wellness programs at work. Everyone, she stressed, regardless of circumstance, would benefit from such programs. “You just never know,” she said, what challenging curveball life may throw your way. Neurosurgeon Linda Liau, MD, 49, Professor and Director of the UCLA Brain Tumor Program walks out of the operating theatre after successfully removing a tumour from a patient at the Ronald Reagan UCLA Medical Center in Los Angeles, California, United States, May 26, 2016. Liau has been a neurosurgeon for 25 years and has developed a brain cancer vaccine that is in clinical trials.